The XENON100 detector, shown here, searches for dark matter candidate particles called WIMPS. A 13-month search reported in July 2012 found no evidence for the elusive particles. The most sensitive search yet for the elusive particles that may make up dark matter has turned up nothing, putting stronger limits than ever on the ingredients of nature's invisible stuff. Dark matter is thought to make up about 83 percent of the matter in the universe, yet scientists can't see or touch it. Astronomers detect its presence through its gravitational pull on the normal matter of galaxies and stars. A leading idea suggests dark matter is made of particles called WIMPS (shorthand for "Weakly Interacting Massive Particles") predicted by some theoretical physics models. These heavy particles would pervade the universe, flying through Earth and our bodies every moment, yet would almost never collide with other particles, so would be virtually undetectable. To exploit the slim, but not nonexistent, chances of WIMPS showing themselves, an experiment called XENON100 has been running deep underground at the Gran Sasso Laboratory in Italy. There, a vat filled with 137 pounds (62 kilograms) of liquid, ultra-pure xenon is protected by the 5,000 feet (1,520 meters) of ground above it, as well as layers of copper, polyethylene, lead and water, in an attempt to shield it from anything but WIMPS. After collecting data for 13 months, scientists reported only two events that could have been collisions between WIMP particles and the xenon liquid. However, these two events could also have been caused by impacts from background particles, such as cosmic rays from space, that managed to bypass the detector's shields. "Two events being observed are statistically consistent with one expected event from background radiation," the researchers said in a statement. Thus, the experimenters concluded that their findings "provided no evidence for the existence of Weakly Interacting Massive Particles (WIMPs)." The null result doesn't mean that WIMPS don't exist, though — for now, it means that the particles, if they do exist, are even harder to find, and interact even more rarely, than some models had suggested. The researchers hope that further measurements will either discover the rumored particles, or rule them out completely. 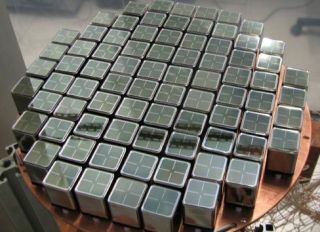 "Continued measurements with XENON100 and the new experiment XENON1T, currently under construction, should either find evidence for WIMPs or other forms of dark matter would have to be considered," according to the statement. The researchers have submitted a paper reporting their findings to the journal Physical Review Letters.